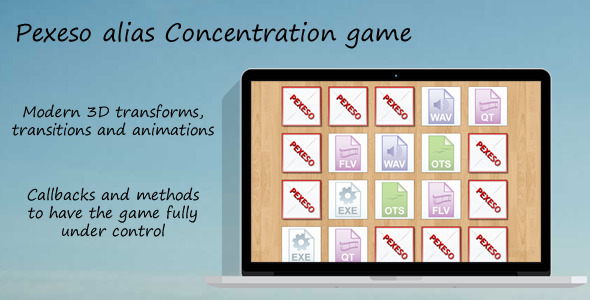 Pexeso alias Concentration or Memory game, also known as Pelmanism or simply Pairs. Game for one or more players. Php file included for generating images from directory as a setting for the game, so they do not have to be added manually. Note: Game generator and game management in live preview are not included. If you are interested in such full game generator, please feel free to use the generator code in live preview or leave me a note, I can provide you all code from this page. Note: Game do not use server, it fully client-based, that’s why the results are not reliable, because without server supervision client can cheat. Note: Images in live preview are not included. This entry was posted in Uncategorized and tagged 3d transform, animations, concentration, database, feeds, forms, game, media, memory, pairs, pelmanism, pexeso, php, player, scripts, sliders by Acty. Bookmark the permalink.